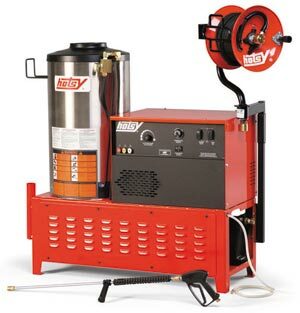 The 1400 Series packs the biggest punch of Hotsy’s portable, electric-powered hot water pressure washers. The 1400 series offers two Baldor motors, one running at 1725 RPM and the other at 3450 RPM, which results in hours of non-stop heavy-duty cleaning. Besides its ruggedness, the 1400 series is also ETL certified to the rigid UL-1776 safety standards. All models come standard with a stainless steel coil skin.